Now, this is a week to remember! Saturday, my good friend and financial adviser, Kevin Murphy of Ameriprise held a brunch featuring my book, “The 13th Demon: Altar of the Spiral Eye”. Sherry and I were expecting maybe a dozen people to show up but the room was full with around 50 attendees! I was stunned. Kevin asked me to speak and answer questions. 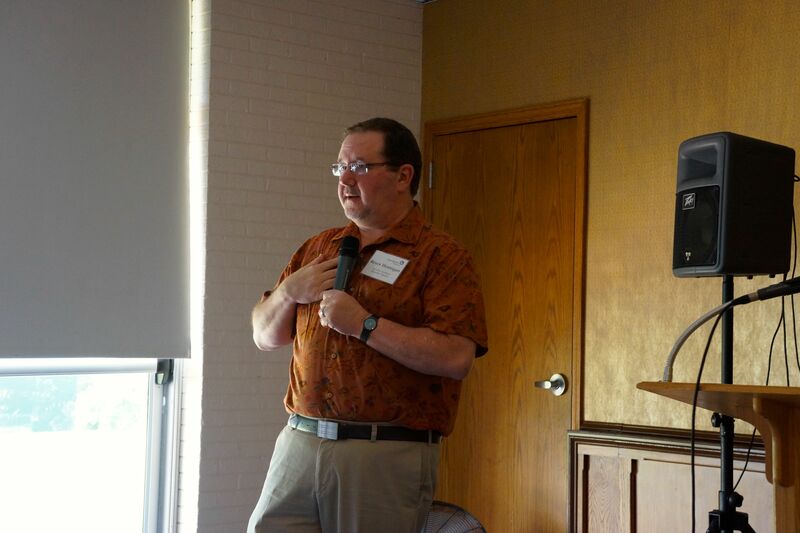 I talked about the development of my writing career to date and the process of writing “The 13th Demon”. And, I brought along a copy of that old reliable book I had co-authored, “Conquering Depression”. I was stunned when over half of those there wanted a copy of that book! Kevin took names and agreed to purchase copies and send them to those who signed up. I am continually amazed at how this little known book continues to change lives everywhere I go! Last Sunday, Mark Sutton and I spent six hours working on a plan for a future upgrade to “Conquering Depression” and the developments of the week at the ICRS impacted the future of that book! And, just now, I finished putting the final touches and making the final changes to the galley proofs of “The 12th Demon: Mark of the Wolf Dragon”! That book is now on its way to the printer with the cover and back design in place and the book endorsements tucked onto the first page. I am now making plans for the book launch. For now, the book launch is planned for Friday, October 19th at the Well, the coffee shop of Brookwood Baptist Church in Shreveport. Like last year, we will have refreshments, giveaways and I hope we have another huge crowd. I have also scheduled a book signing at First Baptist Church Orlando for October 27 and 28. If you know of a book store that might be interested in having me for a book signing, just contact me and let me know. Get me the contact information and I’ll turn it over to Charisma. God is SO good. He is in charge and His plans are so much grander and more satisfying than we can ever imagine! So, why didn’t I say much about Tuesday? Let’s just say I was part of some very special, very shocking (but not to God) developments for my future as an author and I’m still pinching myself. I’m still in shock. I’m still overwhelmed as much by the possibilities that were presented to me (and a certain co-author) and the awesome way in which God brought all of this to fruition. It is truly a tale worthy of Christian fiction but in this case all true. And, one day soon, I hope I can share the details! So, the rest of the ICRS show was a blur after Tuesday morning. What is it like going to this show? Let me give you some quick idea. 1. 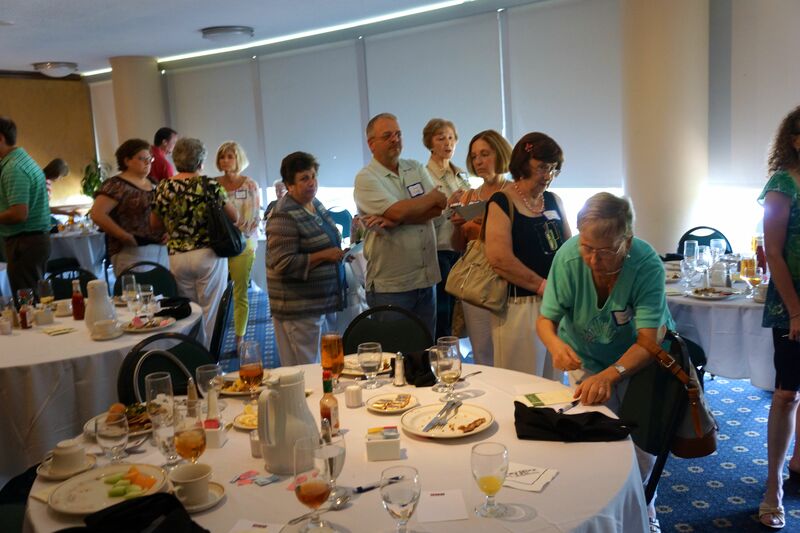 When in line for a book signing you will be overwhelmed by authors pitching their books. I was once a self-published author and, frankly, I admire their guts for being so bold to promote themselves. After a while I had to burst their bubbles by telling them, “I’m NOT a retailer. I’m an author.” At which point they realized I wasn’t going to carry their book in a store I didn’t run. So, they moved on. I prayed for each and everyone one of these self-published authors. 2. ICRS does so many things very, very well. But, what it doesn’t do well is to advertise book signings. This is left up to each individual publisher. So, if you don’t go by their booth and see their sign for that day’s book signings, you will miss out. When I went to Book Expo America, the main publishing show of the year for all of publishing, there was a list of all book signings at all booths. Now, maybe such a list existed, but if it did, I never heard about it and it wasn’t listed on my iPhone app (another great development by ICRS). 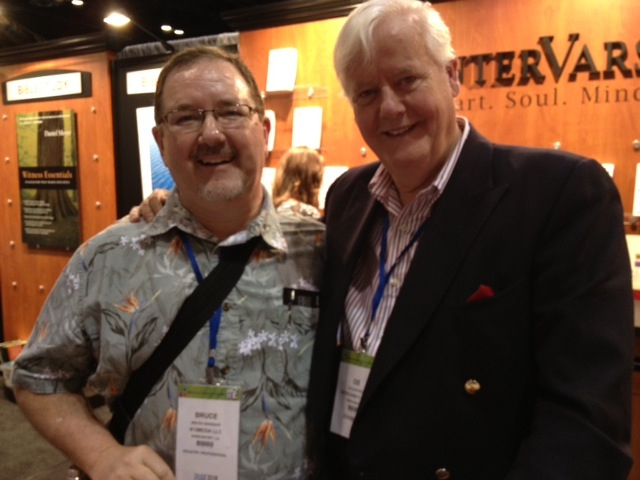 I was fortunate to meet Charles Martin, Ted Dekker, Tosca Lee, Martha Rogers, and Os Guiness. But, I missed out on a whole list of authors I would have loved to meet. Oh, and the books are free and often pre-releases not yet available. If you miss your author, chances are there will be a pile of unsigned books you can snag if you want an advanced copy. 3.There are two good organizations out there every Christian fiction author should know about. 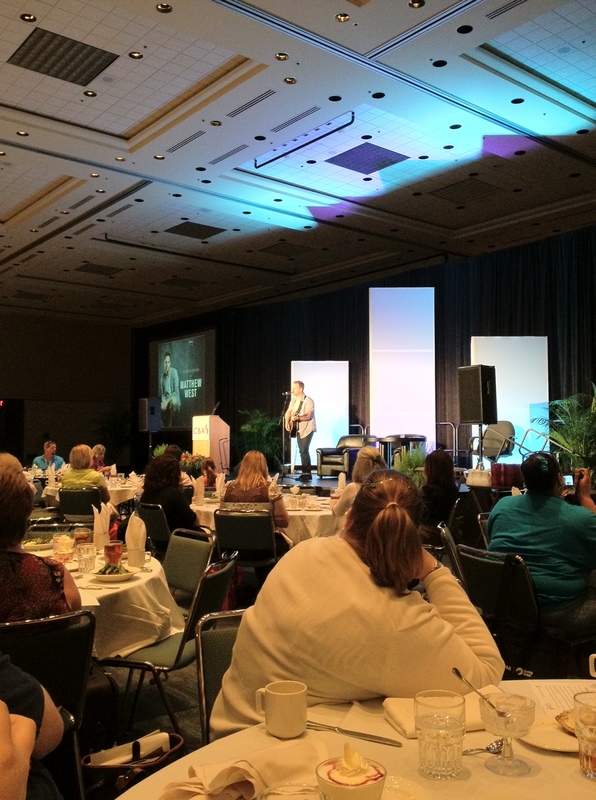 One, of course, is the ACFW, the American Christian Fiction Writers and the CAN, Christian Author’s Network. 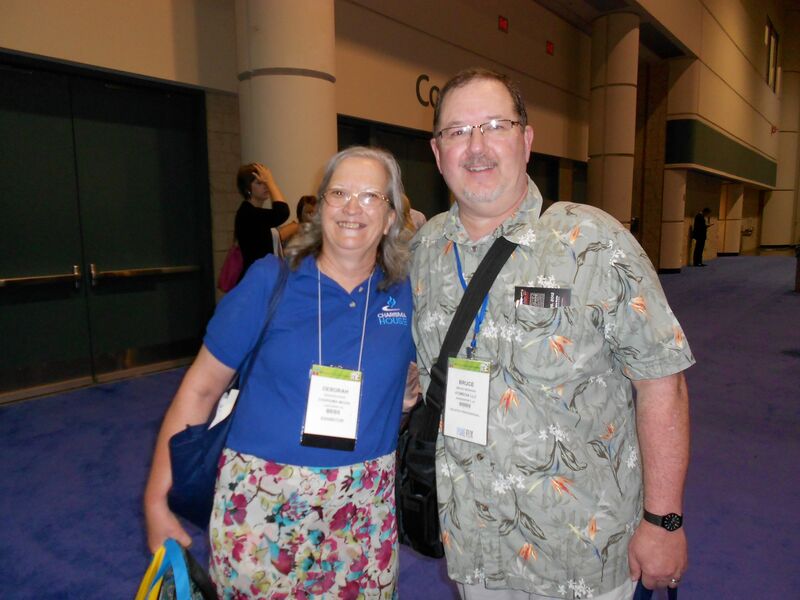 Both of them had a presence at ICRS and both of them promoted authors to the retailers. 4. Take a rolling bag. You will get loaded up with free books and media and trinkets. A nice touch this year (as opposed to 2008) was the shipping section in the back corner. For 12 dollars a box, you could put a cardboard box with your name on it on one of dozens of tables and come back and fill it up as you gathered books. Then, before leaving the show, you could take the box over to the FEDEX table in the same corner and ship your books home. This was a GREAT idea! I won $600 worth of books from CAN and I was able to ship two boxes back. But, I kept my signed copies of books from Charles Martin, Ted Dekker, Tosca Lee, and Os Guiness with me. I don’t want to lose them. 5. The ICRS is overwhelming from the kids running around handing out leaflets to the old man blowing the ram’s horn every thirty minutes to the loud raucous presentations at “Town Center” to the music playing in the music aisles. By the second day, I was shell shocked. There is no way to describe how overwhelming the atmosphere can be. It is exciting and challenging and humbling and tiring all at the same time. If you are an author, you can become a CBA member as an “industry professional” and you can make appointments with major publishers to pitch your ideas. You can learn a lot about the distribution side of publishing. You can learn a lot about how stores handle selling ebooks, for instance. And, if the timing is right and God has ordained, you might wander into the biggest proposal of your life!!! Until next year, I’m hanging up my dress walking shoes and putting away the frazzled rolling bag and putting my own cards for “The 12th Demon” on the shelf and I’m taking a much deserved nap. Because tomorrow, there is WORK to be done!!! Now, after lunch, the fun began! 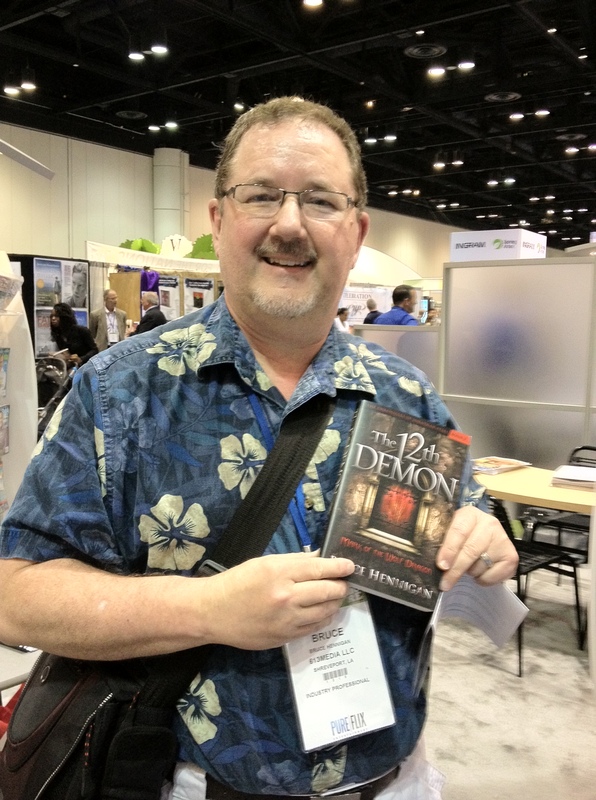 I ran into Debbie Strang at the Charisma Media booth and she took me over to a shelf and showed me a mockup of my upcoming book, “The 12th Demon: Mark of the Wolf Dragon”. I cannot begin to tell anyone what it is like to hold your next book in your hands! It was awesome as you can see by my smile in this picture. 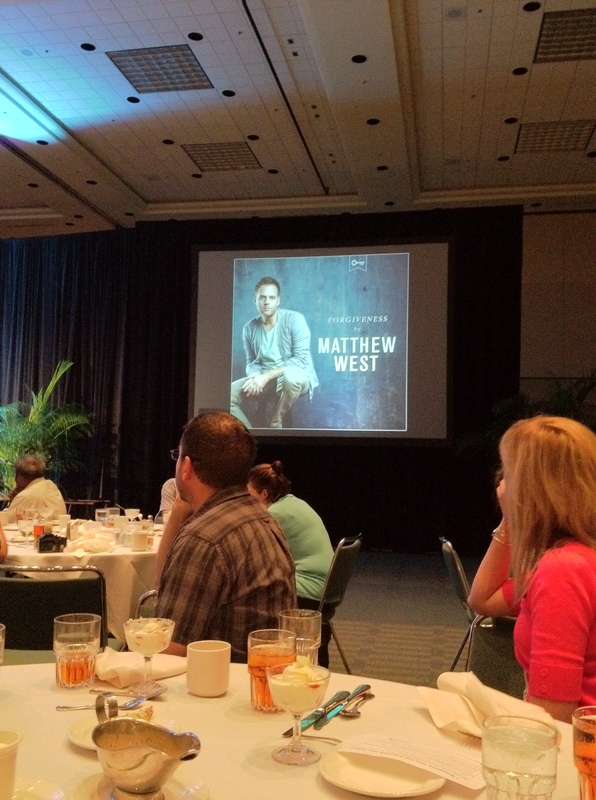 Then, Atalie, part of the Charisma team, told me that Matthew West was signing copies of his CD single RIGHT NOW! So, having just heard Matthew, I followed Atalie and got in line. 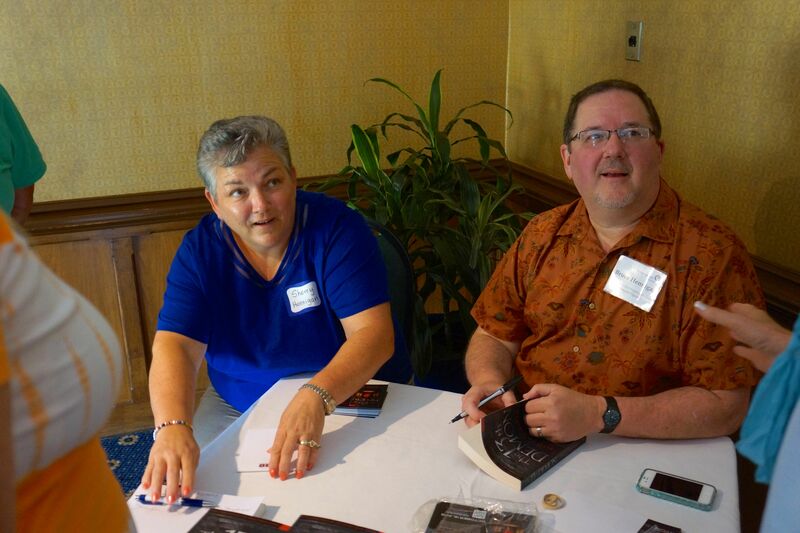 She had to leave to go meet with the next author for his book signing and asked me to get her an autographed copy. It was interesting standing in line for a short while with her and a team member from Tyndale and listen to their “inside scoops” of prominent authors such as James Scott and lots of romance writers whose names you would instantly recognize. Then Atalie was off and I was standing in front of Matthew West. I told him how much his song meant to me and how I appreciate his desire to tell the stories all around us. 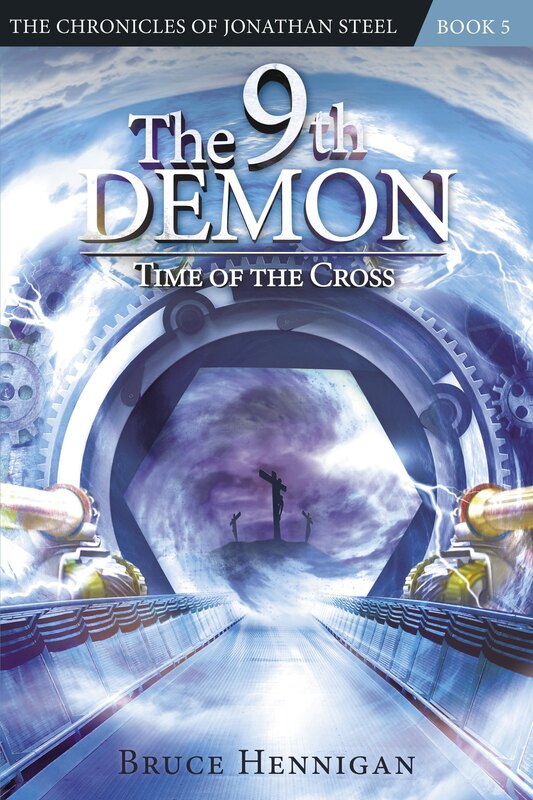 He then looked at the card with my book cover on it (12th demon) and asked all about my book. He took a card and said he would read it when it came out. We’ll see! 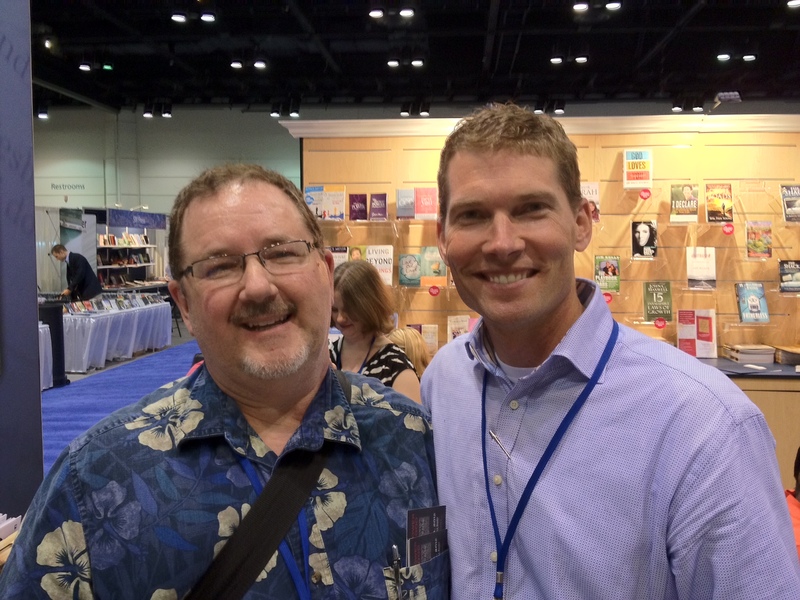 I then took Atalie her CD and headed over to the FaithWords booth to get in line to see Tosca Lee and Ted Dekker — the biggest names right now in Speculative Christian Fiction. Now, several weeks ago, I wrote a review of “Thunder and Rain” by Charles Martin. He is, without a doubt, one of my favorite top 5 authors. As I walked up to the booth, I spied a pile of “Thunder and Rain” books. I was stunned! Was Charles Martin here? I asked the man piling up the books and he pointed right behind me. There was Charles Martin talking to his wife. I had just missed his book signing. But, being an opportunist, I grabbed a book and, like a trembling fanboy, asked Charles to sign my book. He was gracious and funny and signed my book while I hemmed and hawed and tittered and giggled. I finally got control over myself and we had a nice conversation about his writing, his books, and the fact I was an author. Then, heart pounding, I got in line for Tosca Lee and Ted Dekker. I handed Tosca my card with my book cover on it because I had written my name and my wife’s name on the back. 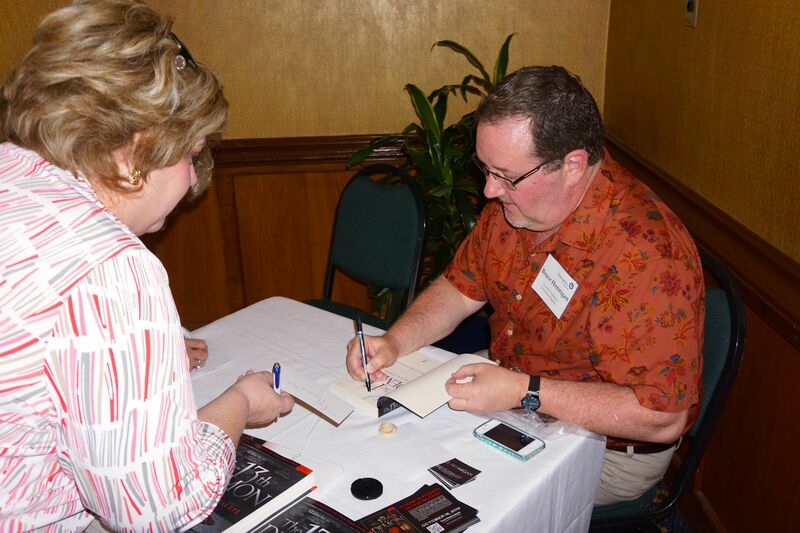 At my book signings, I always have people write down the name they want the book dedicated to. This avoids any misspellings. 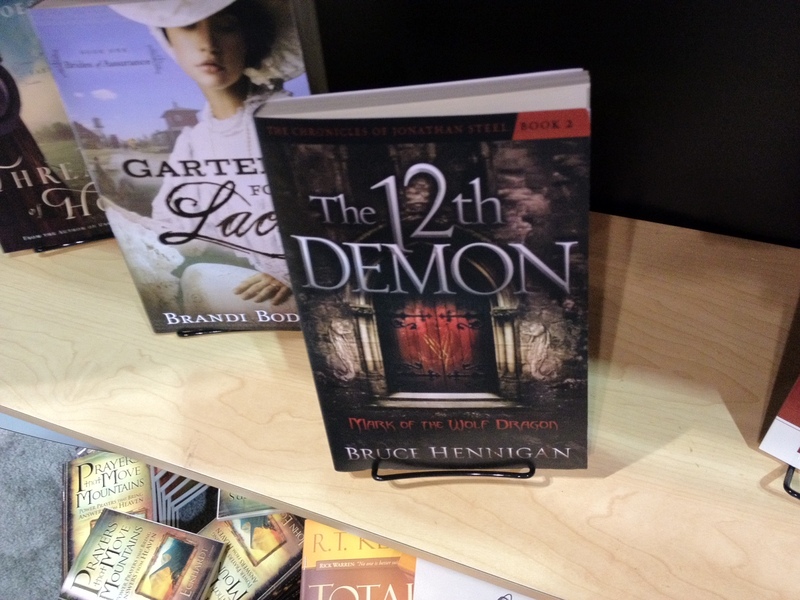 Now, while in line, I spied “The Sanctuary”, Ted Dekker’s newest solo book and the front cover was suspiciously similar to the cover of “The 12th Demon” with an arched doorway just as my book had. I spoke with Tosca and Ted both about my book and when Tosca turned the card over, Ted’s mouth fell open. He jerked the card out of her hand and stared at MY cover. Tosca said something about how much it looked like his newest book cover. Ted looked up at me. “The awesome graphic designers at Charisma Media.” I replied. So, here is a shout out to the graphic designers at Charisma. Ted Dekker loves the cover design for MY book! Way to go! I walked away proud to be an author for Charisma!!! And, at that point, I had to leave and go pick up my daughter at the airport. 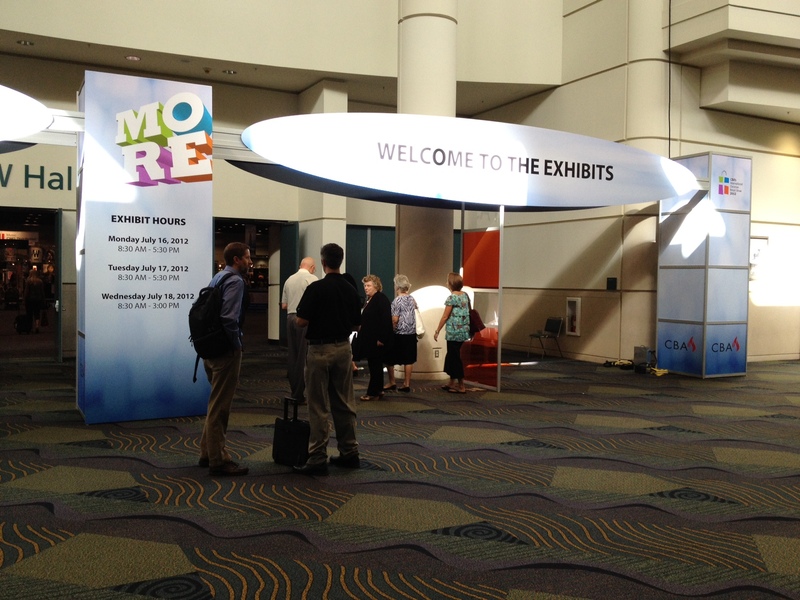 But, it was an incredibly, unbelievable, fulfilling day at ICRS. And, tomorrow will be better! Be sure and read both parts 1 and 2. But for part 1 of the afternoon, I want to focus on the Membership Luncheon. 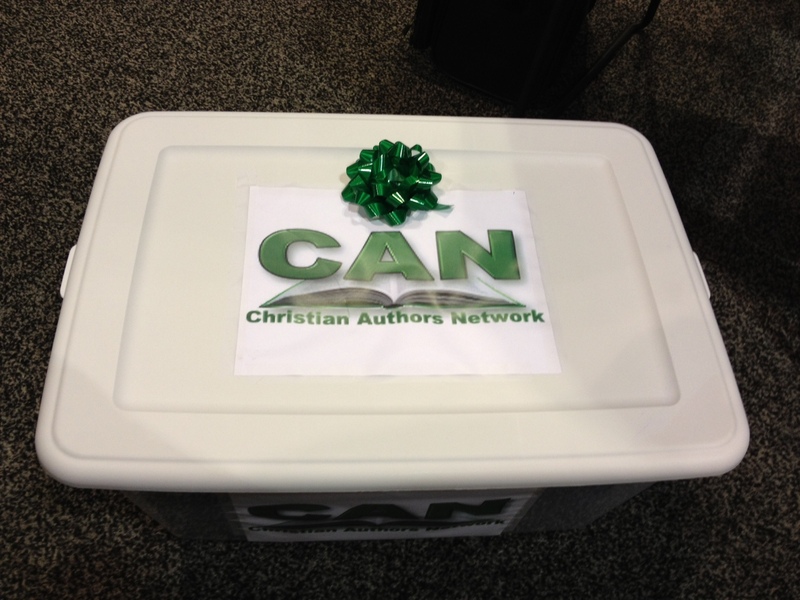 First, though, I won a bin of books from the Christian Author’s Network worth $600! To that end, the DBA is emphasizing a week of reaching out to the children in need of food in our communities with an emphasis on that ministry the week of Sept. 30 through October 5th and it will be called “Christian Store Week”. He asked that any author who had a favorite “cause” should approach the stores and link support of that “cause” with a store appearance — either as a book signing or a book reading or an offer to donate the “profits” of the author’s book sales to that charity for that day. How this is done through the stores was a little beyond me. They used some fancy terms about “rounding up” the cost of the book and taking the difference between the rounded up price and the list price as using that as the “donation”. The point is that if YOU are interested in being a part of this emphasis, that week would be an excellent week to contact a book store and see if you can participate and support the store. Another term that surfaced was “showrooming”. In this phenomenon (I am guilty of) the reader comes in and browses books. They then leave and purchase the books on Amazon. They emphasized that there are developing technologies at this year’s show that allow stores to capture those sales by allowing them to be made while in the store and the store gets “credit” for the sales. I believe this model is in place for the Nook and Barnes & Nobles stores. Also, they said that publishers now refer to themselves as “content providers” not just book publishers. 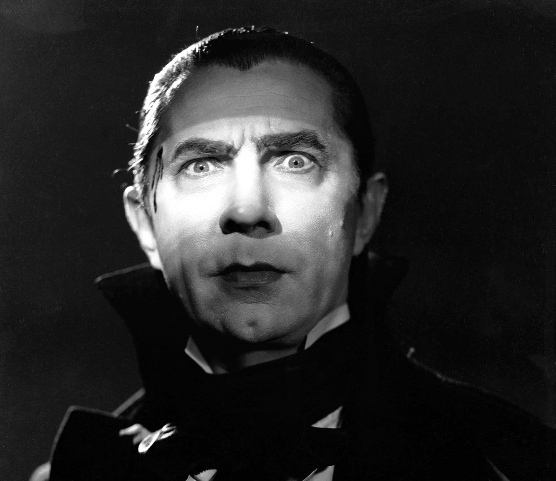 Overall, they did not lament the current state of affairs over E-Book sales. Rather, they were ecstatic that Christian writers and artists were selling content that was of Christian origin, no matter who sells it. Next, Matthew West go up and sang a few songs. What was moving to me as a writer was the projects Matthew has been involved in for the past two years. He started out asking for stories from his listeners that would serve to inspire songs he would write. He was anticipating “a couple of hundred but we ended up with over 20,000.” He sang a couple of songs I recognized and then introduced his newest song “Forgiveness”. Here is where it got really moving. He showed a video of the story on which the song was based. A mother lost one of her twin teenagers to a drunk driver. She started traveling the country speaking out against drunk driving and the driver received a jail sentence of 22 years. But, she felt moved by God to go and forgive the man. She did and he became a Christian. Eventually, she asked that his sentenced by halved so he could join her in her new ministry. Matthew then sang the song “Forgiveness” based on the story. At the end, he asked someone to come up on the stage and it was the mother who told the story! It was incredibly moving. Not a dry eye in the house!!! And, that was lunch! Talk about getting full! I parked in the West Parking Lot and after walking across the world, I arrived at the International Retail Christian Show. If you have never been, it is OVERWHELMING! A huge exhibit floor filled with all kinds of media companies. 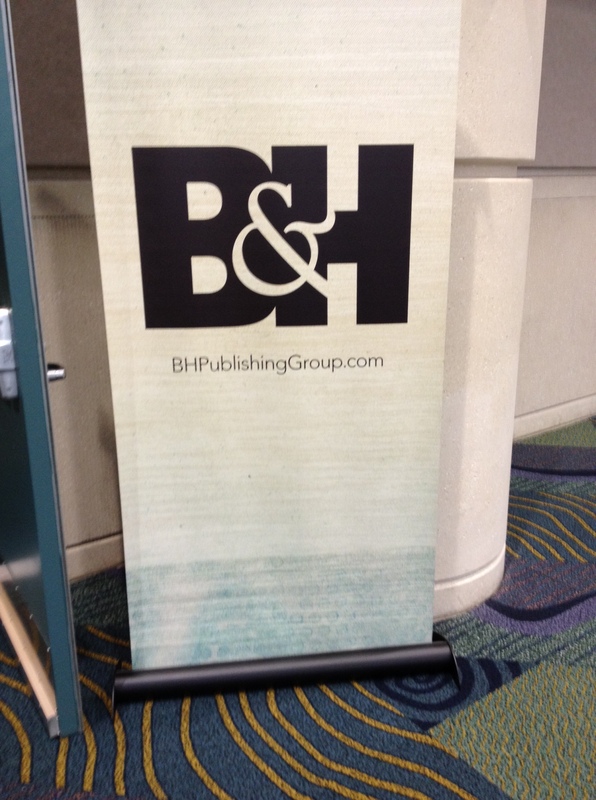 I was wandering down the hallway in front of the main exhibit hall and noticed the B&H Publishing room off the hallway. Now, I have a book with B&H, “Conquering Depression” published in 2001. Not many people know this, but Mark Sutton, my co-author, and I are considering an update of the book at the urgings of our agent, Jeff Jernigan. I wandered into the room and instantly met with two wonderful people who recognized my name and told me they have been considering an update to the book! I can’t go into the details, but within 15 minutes of arriving, I already had a meeting scheduled with B&H over the future of my depression book. rkshop booth, there were a plethora of Christian fiction authors answering questions. 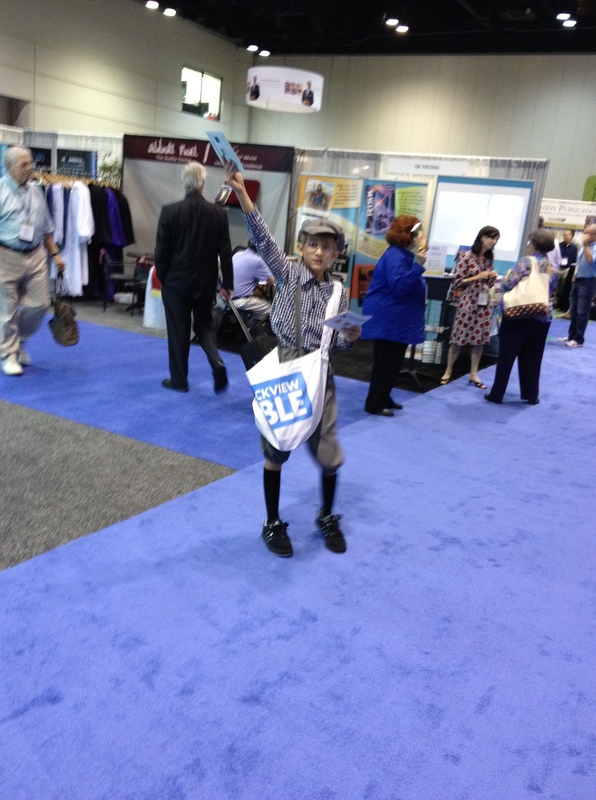 I ran into this kid dressed like an old school newspaper cryer handing out information. I am now sitting in the “Town Center” listening to a presentation by the Christian Author Network. I’ll continue to keep updating the blog throughout the day. Right now, I’m already tired and I’ve been here only an hour!!! !